Aeroscout’s MobileView provides a simple, yet powerful means of tracking the location, status, and condition of assets and people. The Web-based software platform has a full range of applications with visualization, reporting, management and automated alerting options, as well as the ability to deliver context-aware visibility data to a variety of third-party applications. MobileView unifies asset visibility data from many sources, such as AeroScout‘s Wi-Fi Tags, Wi-Fi clients, Passive RFID, GPS, and sensors, and turns this data into automated business processes – delivering a scalable, enterprise-proven software solution. Manual processes to manage capital and rental equipment are inefficient, labor-intensive, and error-prone. If staff finds it difficult to locate the portable equipment they need, they may stockpile it when they do locate it—exacerbating the issue of equipment availability. 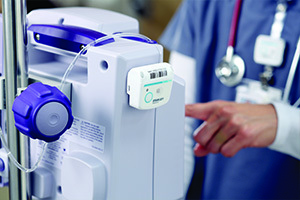 Patients often have to wait for equipment when staff have difficulty locating it. Not only can this be a stressor for patients, but it can also be dangerous. The AeroScout Asset Management Solution addresses all these challenges by automatically monitoring the status and location of assets. The solution reduces staff time spent searching for, delivering, maintaining, and cleaning equipment through real-time status and location of equipment. It also increases equipment utilization and lowers shrinkage rates while decreasing rental fees and penalties. By providing immediate access to equipment, it helps to improve patient outcomes and experiences. The system reduces time and effort spent on maintaining par levels. Location history that pinpoints equipment associated with an infectious patient helps prevent the spread of infection. Our MobileView Analytics dashboards provide a higher level of operational insight inventory quantity and location, par levels and equipment process cycle status with powerful, visually-driven analytics. Asset Management analytics is available on-premise or through a cloud-based subscription. Keep infants secure with the top Infant Protection Solution. The Hugs Infant Protection Solution is a comprehensive infant security system that includes tamper alarms, exit alarms, and out-of-unit alerts that allow staff to act quickly. The system sends alerts directly to caregivers and automates the transfer of infants between areas of the hospital for smoother workflow and uninterrupted security. It provides tangible proof to parents that their infants are safe and secure. No other infant security provider matches the power of the Hugs system. It is the only infant protection system on the market to provide, proven hospital-wide infant projection. It does this by leveraging a hospital’s existing Wi-Fi infrastructure to give the ability to locate an infant anywhere with Wi-Fi coverage. And with the Kisses® option, hospitals provide an extra layer of protection – Kisses is the only audible and automatic mother/infant matching solution on the market. The STANLEY Healthcare Pediatric Security solution is the only system specifically designed to protect pediatric patients from abduction and patient flight. 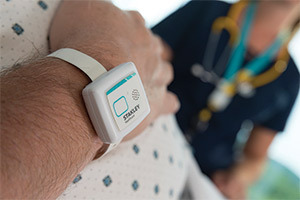 A unique patient tag designed for older children is matched by multiple software options to facilitate smooth patient transfers and customizable security based on each patient’s risk profile. The solution uses the same proven technology of STANLEY Healthcare’s Hugs® infant protection solution, in use at over 1,600 hospitals worldwide. The integration of real-time visibility with a Nurse Call system enables a variety of process, safety, and quality of care improvements. 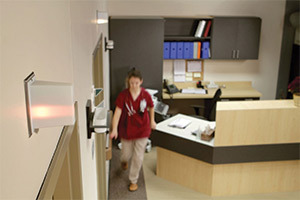 Staff wearing Wi-Fi tags are located precisely when entering or existing patient rooms, anywhere in the department or throughout the hospital. Control dome lights based on staff presence in the room. Shows different light color based on staff role. Automatically cancels calls when staff enters or exits the room. Quickly locate assigned staff members throughout the department/unit, enabling rapid response time to patients by routing calls to the closest staff member. Historical location data enables recording when a staff member was in a patient room, duration of time spent with a patient, and the time it took to respond to a patient event. 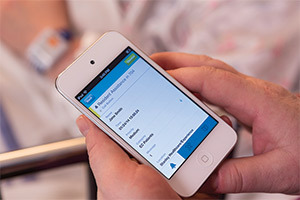 MobileView alerts can be routed to a specific caregiver through the Nurse Call system. 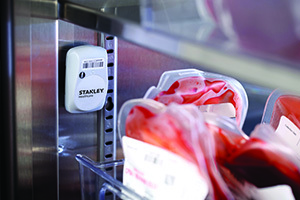 STANLEY Healthcare’s AeroScout® Hand Hygiene Compliance Monitoring Solution overcomes the host of challenges associated with manual monitoring. 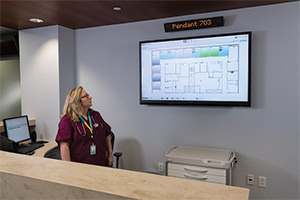 Using a hospital’s existing Wi-Fi infrastructure, the solution combines Wi-Fi badges worn by caregivers, exciters embedded in soap, gel and foam dispensers, and exciters in patient rooms. These components work in concert to automatically capture data about hand hygiene compliance. No human observation. No manual data entry. No impact on care. The system fosters caregiver accountability through automatic detection of hand washing and real-time analytics reports on compliance. Absolute patient safety is attainable through position infection control as a solid and essential element of patient safety—embedding it in the organization’s culture and operation. The AeroScout Temperature Monitoring solution eliminates manual temperature monitoring and enables staff to focus on clinical tasks. By employing a standard Wi-Fi network, the system requires minimal setup time and is easy and low-cost to deploy. In just a few days, you can be up and running with automated collection and logging of temperature data via 24/7/365 monitoring of critical storage items such as blood, tissues, drugs, vaccines, and organs. This system empowers you to continuously adhere to regulatory compliance and eliminate medication spoilage with real-time alerts and intuitive analytics dashboards. And now, AeroScout includes a full Vaccines For Children (VFC) solution that is 100% compliant with the new recommendations for the CDC VFC program. And with our ISO 17025 Accredited Tag Calibration and Certification Program, we streamline the annual NIST-traceable tag recalibration process. TotalKare is able to provide, by request, refresher and/or comprehensive training provided by the manufacturers themselves to enable facilities to utilize their systems to their greatest potential. Comprehensive training will cover all shifts and staff will be trained on all features of the system and best practices. For the Hugs Infant Protection System, the facility will have access to the Stanley Healthcare Clinical Education Team of highly skilled nursing professionals.